UN reports call for carbon taxes as high as $27,000 per ton of emissions to limit global warming. 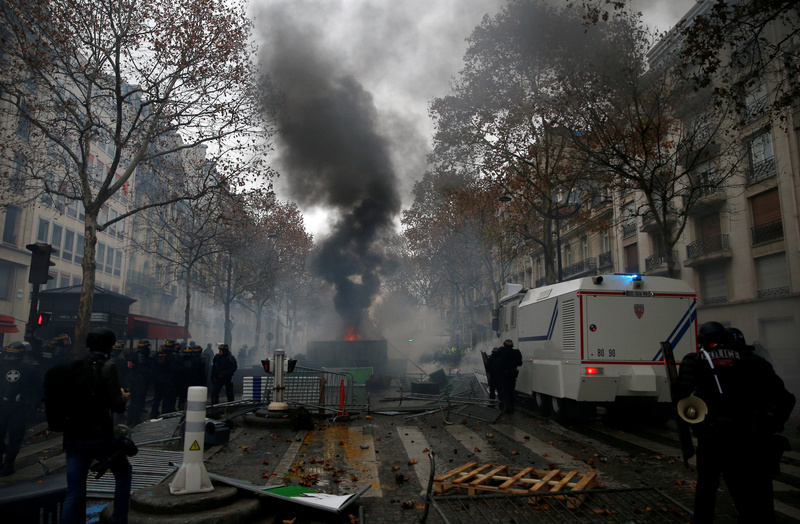 The French government delayed implementing carbon taxes in the wake of rioting. The French government was forced to scrap plans to increase taxes on carbon dioxide emissions Tuesday after weeks of protests, but the planned carbon taxes were not nearly as high as what the United Nations recommends. France’s planned carbon tax on diesel would have come out to $37 per metric ton and $22 per ton, respectively. But that’s roughly half of what the UN says a carbon tax should be in order to keep future global warming below 2 degrees Celsius. France’s planned taxes would have raised the cost of diesel by 33 cents per gallon and gasoline by 17 cents per gallon, but that’s about half of what the UN calls for to limit global warming, environmental economist Richard Tol noted. The UN’s emissions gap report suggests a carbon tax as high as $70 per ton would go further in reducing carbon dioxide emissions blamed for global warming. “Studies show that a carbon tax of US$70/tCO2 in addition to existing measures could reduce emissions from just above 10 percent in some countries to more than 40 percent in other countries,” the UN reported, adding these taxes would also raise revenue. The French government announced it would delay implementing the carbon taxes by six months after weeks of protests that turned deadly. At least three people were killed, more than 100 were injured and police arrested hundreds more. FILE PHOTO: French riot police stand guard near a barricade during clashes with protesters wearing yellow vests, a symbol of a French drivers’ protest against higher diesel taxes, at the Place de l’Etoile in Paris, France, December 1, 2018. REUTERS/Stephane Mahe. France is party to the Paris climate accord, which calls for keeping future global warming below 2 degrees Celsius by 2100 through emissions cuts. However, the UN is pushing to keep future warming below 1.5 degrees by 2100 — a plan it says would require higher taxes. 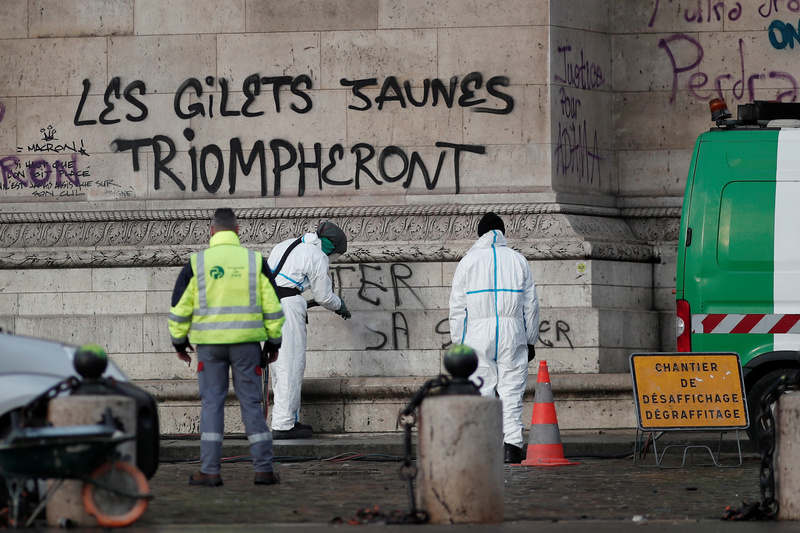 Cleanup operations continue under the message, “The Yellow Vests will Triumph” written on the Arc de Triomphe, the morning after clashes with protesters wearing yellow vests, a symbol of a French drivers’ protest against higher diesel taxes, in Paris, France, December 2, 2018. REUTERS/Benoit Tessier.